Click each of the big certificates below to install the Legacy, Pacy World and TDMC, Inc. root CA's n your browser (note there are two). For an explanation on what this is continue reading. Hint: Apple iPhone users should select to install the individual certificates instead of the combined option. Microsoft Windows 10 users can instead download and run the following update package. 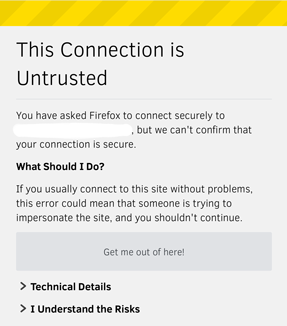 If you are having problems loading web pages and the error message is similar to "This connection is Untrusted", then your web browser is missing root certificates. A website that uses encryption to protect your privacy and sensitive information relies on something called a TLS certificate chain in order to validate the content is indeed from the original source. Unfortunately due to the design of the current implementation of TLS certificates, web browsers are highly dependant on centralized entities called "Certificate Authorities" (CA) to make this work. It's impossible for a web browser vendor to a pre-load every CA in existence, your browser vendor may simply not know about them. It's up to you (the end user) to install any missing CA's so that you can properly open web pages. You may also want to kindly send a note to your browser vendor informing them of the CA's they missed so that other users won't have to go through the same trouble you did. Usually this is done in the form of a bug report or support ticket.